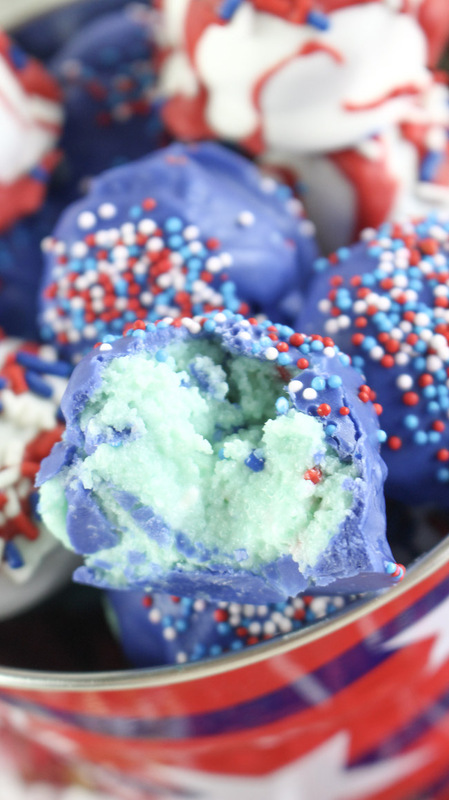 Cake Batter Truffles Recipe For The 4th of July | Be Plum Crazy! 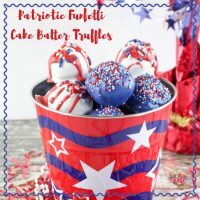 Patriotic Funfetti Cake Batter Truffles Recipe! While the kids are splashing poolside and the adults are having cocktails and enjoying much needed R&R time – these cake batter truffles will be a centerpiece on the dessert table! The mixture of chocolate and cakey goodness are sure to make mouths water. The red, white and blue color combination will serve as a a great decor piece before they are gobbled up. Serve them in a create sand bucket like we did and you have an extraordinary dessert that you can bring to every party on your schedule! 1. Preheat oven to 350°. Grease and flour a 13 x 9 baking pan and set aside.2. Add the cake mix, eggs, oil and water to a large mixing bowl. Mix on medium speed with an electric mixer until all the ingredients are well incorporated. 3. Pour into your prepared baking pan and bake for 10-12 minutes or until an inserted toothpick comes out clean. 4. Allow the cake to completely cool for 45 minutes. 5. Once cooled, break the cake up into small pieces and place in a large mixing bowl. Add 1 cup of vanilla frosting and 1/3 cup red, white and blue jimmies sprinkles. Mix well. Cover and refrigerate for 20 minutes for easier handling. 6. Line a large cookie sheet with wax or parchment paper. Set aside. 7. Roll the chilled cake mixture into 1 inch balls and place on the lined cookie sheet. 8. 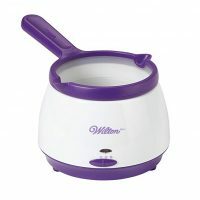 In a microwave safe bowl (or a Wilton candy warmer), microwave the bright white candy melts for 45 seconds. Stir until melted and smooth. 9. Dip 6 cake balls into the melted white chocolate and place on the lined cookie sheet to harden. 10. Add the red candy melts to a microwave safe bowl (or candy warmer). Microwave for 60 seconds. Stir until completely melted and smooth. 11. Drizzle the melted red chocolate on top of the white coated truffles. 12. Immediately sprinkle the white coated truffles with the remaining red, white and blue jimmies sprinkles. 13. Dip 6 cake balls into the remaining melted red chocolate and place on the lined cookie sheet. 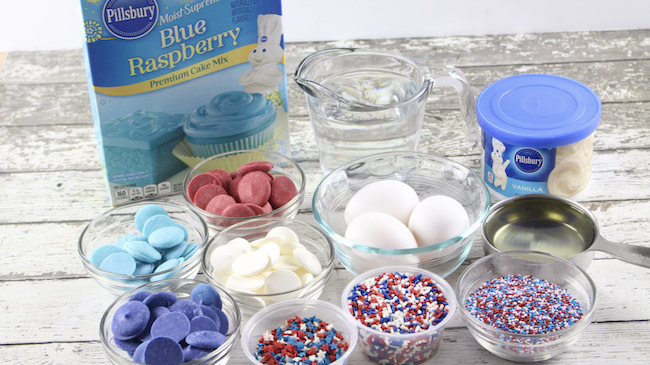 Immediately sprinkle with the patriotic star sprinkles. 14. Add the blue candy melts to a microwave safe bowl and microwave for 45 seconds. Stir until completely melted and smooth. 15. Dip 6 cake balls into the melted blue chocolate and place on the lined cookie sheet. 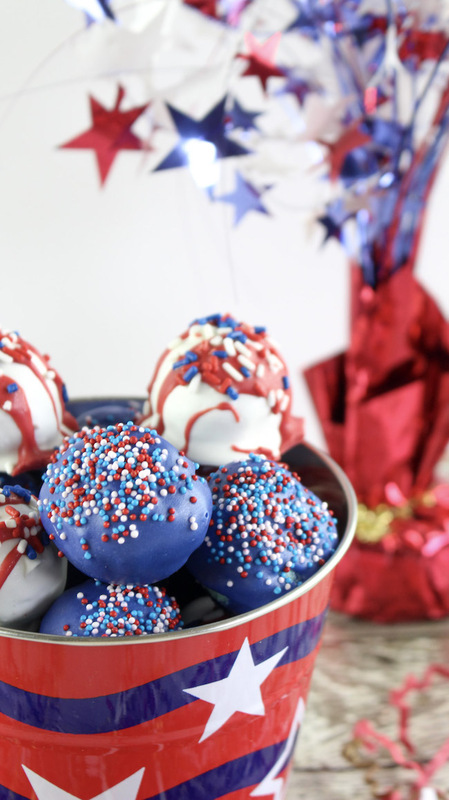 Immediately sprinkle with the remaining patriotic jimmies and nonpareils sprinkles before the chocolate hardens. 16. Melt the royal blue candy melts in a microwave safe bowl for 45 seconds. Stir until melted and smooth. 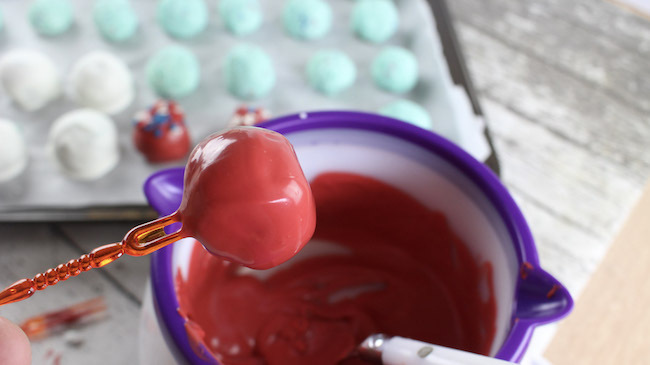 Dip the remaining cake balls into the melted royal blue chocolate. 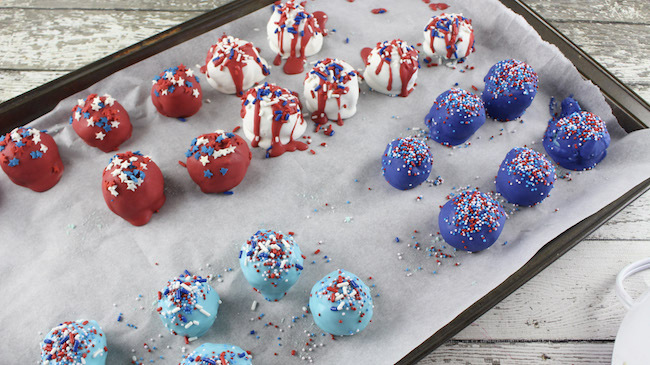 Place on the lined cookie sheet and immediately sprinkle with patriotic nonpareils sprinkles. 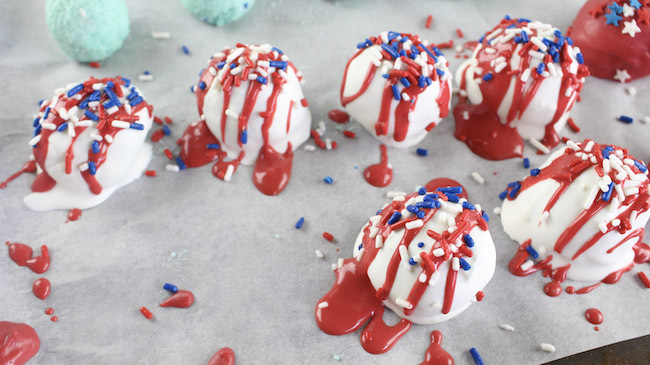 Scrumptious cake batter truffles with patriotic red, white and blue accents. Preheat oven to 350°. Grease and flour a 13 x 9 baking pan and set aside. Add the cake mix, eggs, oil and water to a large mixing bowl. Mix on medium speed with an electric mixer until all the ingredients are well incorporated. Pour into your prepared baking pan and bake for 10-12 minutes or until an inserted toothpick comes out clean. Allow the cake to completely cool for 45 minutes. Once cooled, break the cake up into small pieces and place in a large mixing bowl. 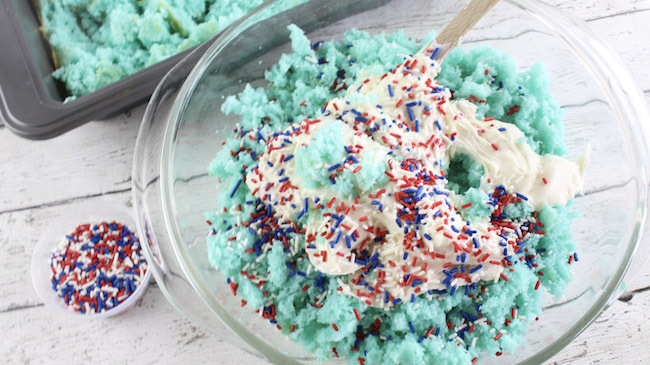 Add 1 cup of vanilla frosting and 1/3 cup red, white and blue jimmies sprinkles. Mix well. Cover and refrigerate for 20 minutes for easier handling. 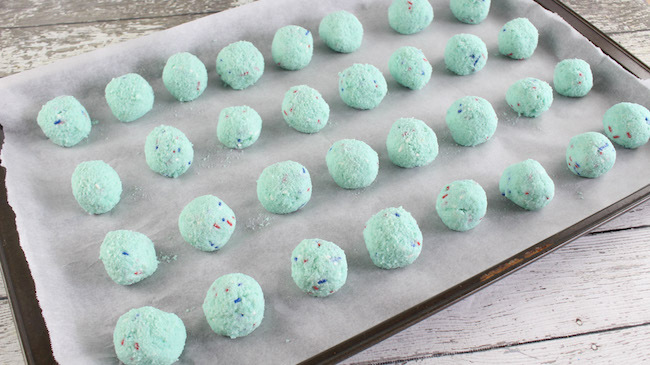 Roll the chilled cake mixture into 1 inch balls and place on the lined cookie sheet. In a microwave safe bowl (or a Wilton candy warmer), microwave the bright white candy melts for 45 seconds. Stir until melted and smooth. Dip 6 cake balls into the melted white chocolate and place on the lined cookie sheet to harden. Add the red candy melts to a microwave safe bowl (or candy warmer). Microwave for 60 seconds. Stir until completely melted and smooth. Drizzle the melted red chocolate on top of the white coated truffles. Immediately sprinkle the white coated truffles with the remaining red, white and blue jimmies sprinkles. Dip 6 cake balls into the remaining melted red chocolate and place on the lined cookie sheet. Immediately sprinkle with the patriotic star sprinkles. Add the blue candy melts to a microwave safe bowl and microwave for 45 seconds. Stir until completely melted and smooth. Dip 6 cake balls into the melted blue chocolate and place on the lined cookie sheet. 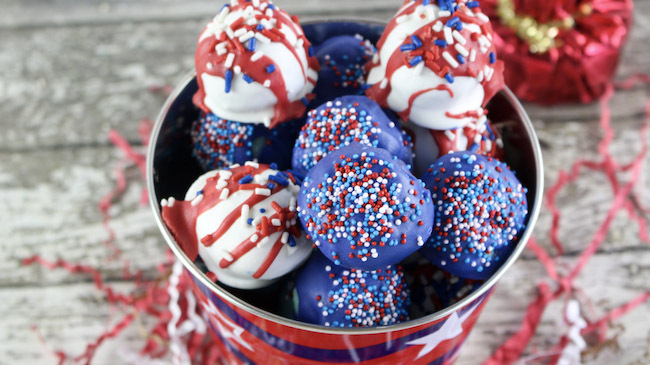 Immediately sprinkle with the remaining patriotic jimmies and nonpareils sprinkles before the chocolate hardens. Melt the royal blue candy melts in a microwave safe bowl for 45 seconds. Stir until melted and smooth. 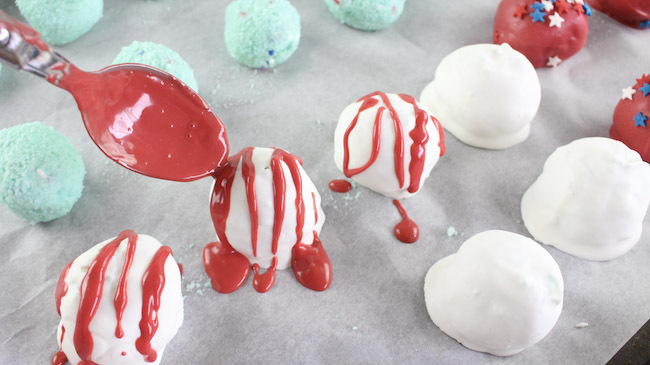 Dip the remaining cake balls into the melted royal blue chocolate. 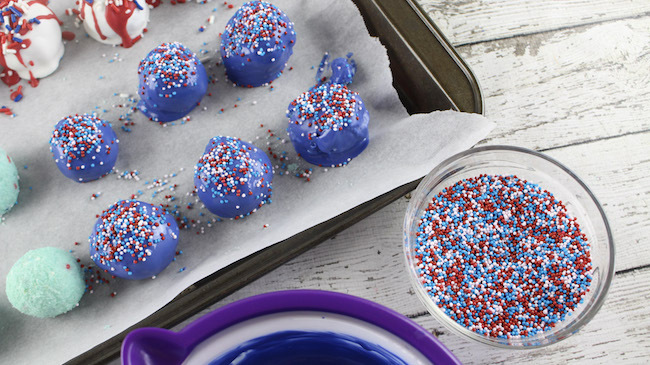 Place on the lined cookie sheet and immediately sprinkle with patriotic nonpareils sprinkles. 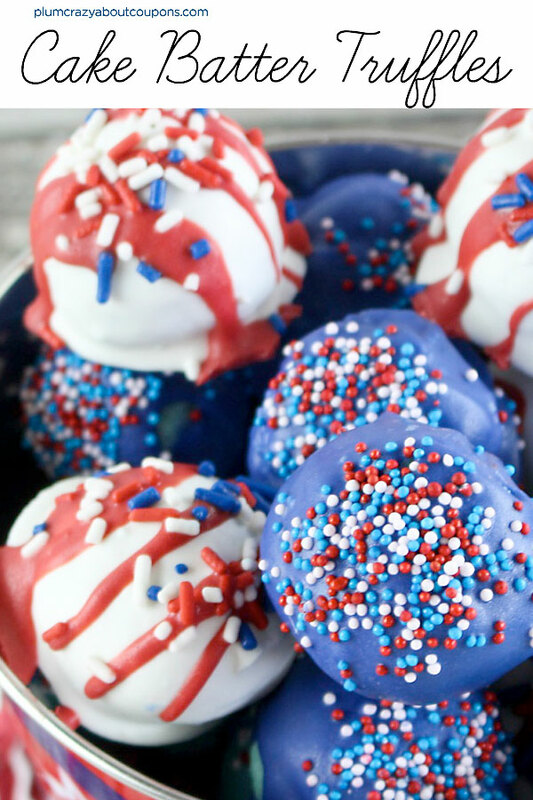 If you are looking for more ideas – check out our roundup of 4th of July desserts that everyone will love! There is sure to be something for everyone.